Back in year 2011 and 2012, astrophysicists working at an Australian observatory caught a sequence of fleeting but powerful radio signals. These signals caught by astrophysicists working at an Australian observatory, have not ever been discovered somewhere else on Earth, casting suspicions on their source. Now, new observations from the Arecibo Observatory in Puerto Rico suggest they're for real. The only observatory to detect these signals, Up until this point, has been the Parkes radio telescope in Australia. The dozen-or-so bursts that appeared in 2011-12 were more likely initiated from outside the galaxy. In a few milliseconds, every radio bursts released as much energy as the sun releases in about 300,000 years. 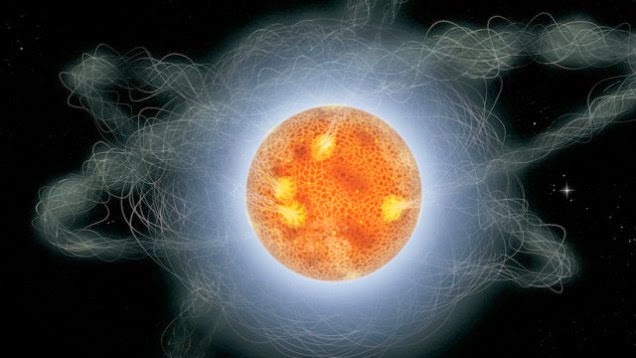 Impression of a blitzar — a hypothetical object that could be the source of the radio bursts. Image Credit: Sky & Telescope/Gregg Dinderman. Astrophysicists have all types of theories regarding what may be causing the bursts, counting blitzars. Blitzars are heavy neutron stars that are fighting the desire to turn into a black hole on the description of their fast spin. Other theories comprise magnetars (magnetars are neutron stars with super-strong magnetic fields), gamma ray bursts that involve a supernova and evaporating black holes. These signals are fascinating because they are pretty much the opposite of pulsars. The new detection of these suspicious signals were made at Arecibo on November 2, 2012, home of the world's biggest single-dish radio telescope. The data indicates a gigantic 3-millisecond spike, but unlike radio detonations generated by some pulsars, the burst did not return. Scientists have confirmed that the signals are genuine, they can concentrate on locating their precise position and confidently determining what originated them. In the end, what astrophysicists really hope for is a method to discover the bursts as they unfold. When this is accomplished, they might be capable enough to recognize a visual foundation, like a host galaxy. You can learn much more about this news at NatGeo. You can also read a pre-print of this study here.